Most projects have constraints. Brick construction, although solid by it's nature, creates issues when you want to change out windows and doors. It can be done, but it's more complicated, and that equates with money. While a lot of the mid modern homes were designed for privacy from the street, they opened up either to the side or back. In this particular situation, the house needs more natural light and air flow. The smaller existing windows are adequate, but we know we can do more to improve the feel. 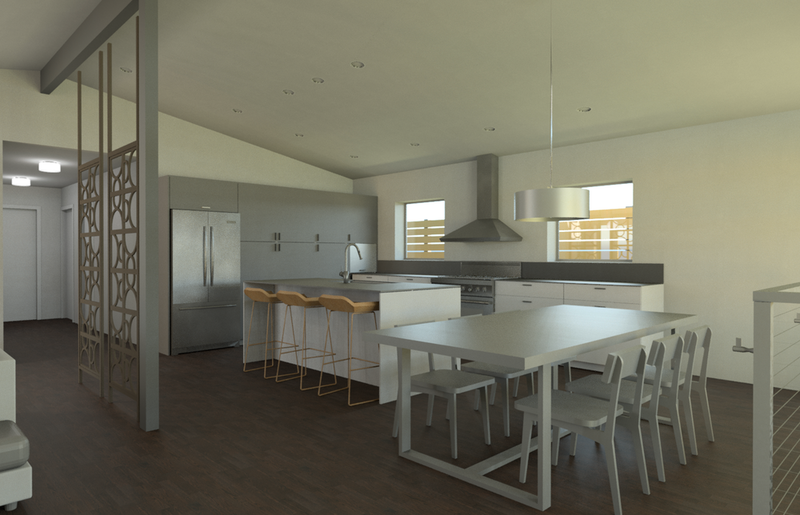 Architectural software like Revit can provide very realistic views of how a space can feel. Particularly for those with the inability to visualize spaces, this is an amazing tool. And even for those of us in the architectural field, it is a very useful tool to help in the decision-making process. We've been studying kitchen layouts and various window configurations. In addition, we can see how various material choices, colors, and lighting will influence the flow and feel of the space.